Lumi-pods is a series of floating pods which integrate light, water, trees and the surrounding environment with human interaction. Using light as a medium, the Lumi-pods respond to the surrounding environment using different light patterns, colors and spotlights which are sometimes precomposed and sometimes improvised. 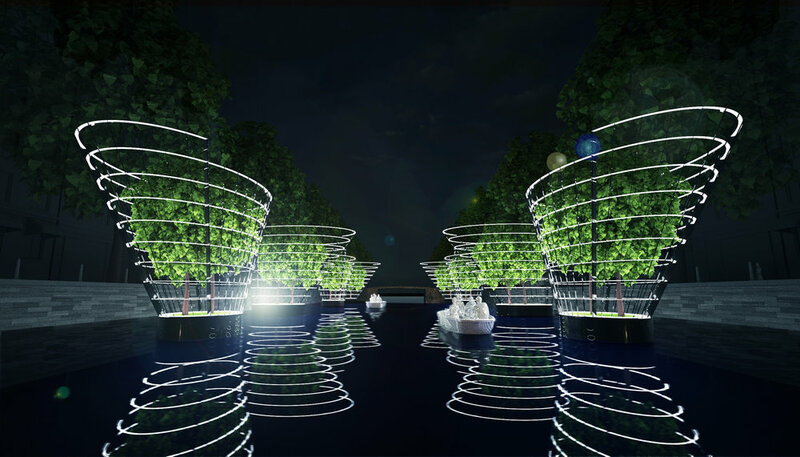 Lumi-pods are floating vessels which bring trees down to the water level to create an atmosphere where subtle visual vibrations and movements are caused by reflections of the leaves and rhythms of the waves. 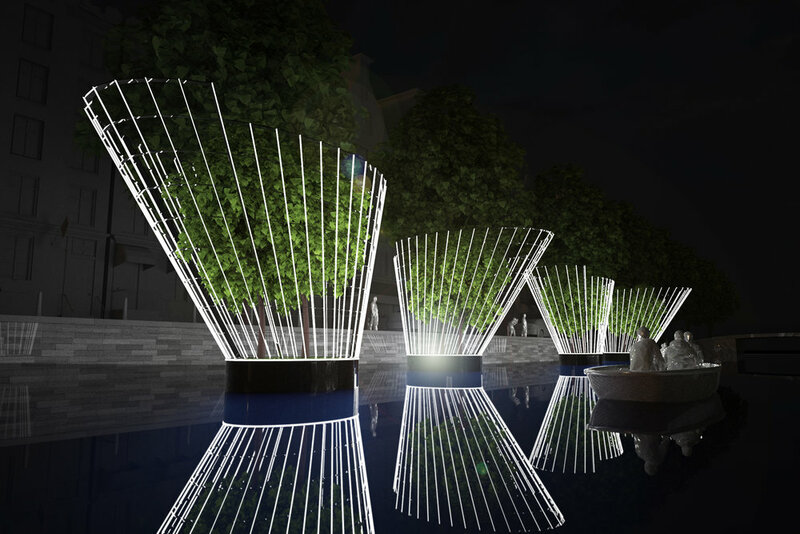 Each trees have dedicated spotlights which can be triggered and controlled by sound or sensual inputs. The composition of the lighting sequences are delivered like visual music created by five hundred vertical and horizontal led light strips, which together create a visual harmony and composition with the vibrations and reflections of the water. Lumi-pods uses light as a medium to create a visual harmony in between water, nature, human and the surrounding environment. Like musical composition or improvisation, Lumi-pod uses the light strands as a visual instrument to harmonize with natural components. By selectively revealing various elements as an intentional sequence, or by translating dynamic forces into light forms, or by reacting to visitor’s inputs, Lumi-pod turns the information into a live form using light. The color, intensity, sequence, speed of the transition, combinations of light forms can all create different harmonies and atmospheres as a musical piece. The flow of the energy expressed by the water and glittering leaves becomes part of the piece with it’s undulating reflection and vibration. As one of the most primary resources of energy, light actively engages and interacts with the natural force and elements. Together with the natural elements, Lumi-pods create visual harmonies of light and nature.